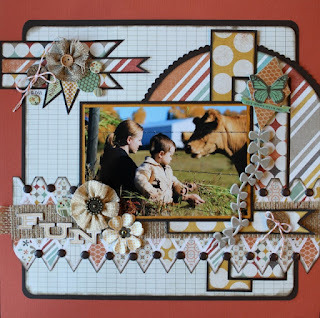 I was super excited when I found out that I had won a kit from Artful Delight and even more excited when I was asked to be a guest designer using the kit. You really should check out their kits! They're awesome! I used the April's sketch and kit to do this layout of Noah and Chantal. When we are at the lake, one of the things that the kids always like to do is go and see the cows and horses at various farms in the area. Of course, while they were busy trying to lure the cows over, I was busy snapping photos. This is one of my favorite photos you have taken. Absolutely gorgeous work Char.You are just rocking this kit out of the park!